Make the most of your precious time off with the LondonTown weekend guide, which gives you the lowdown on the best events and things to do this weekend in London. Want it straight to your inbox? Be sure to subscribe to the weekly Something for the Weekend mailer. 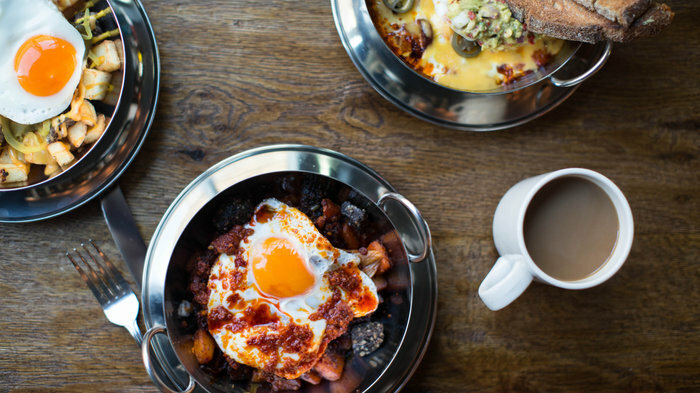 With four glorious days off work, the long Easter weekend is the perfect time to indulge in a boozy bottomless brunch. Not limited to just Saturday and Sunday, plenty of these bottomless brunches run on Good Friday all the way through to Easter Monday, giving you plenty of time to tuck into an Eggs Benedict with a side of free-flowing bubbles. You hear Easter, you think chocolate! Earn your eggs this Easter with a visit to one of these fun and family-friendly Easter egg hunts here in London. Spot the eggs amongst the beautiful scenery of various National Trust properties or enjoy a day with the animals at Battersea Park Zoo. Whatever you choose, it's bound to be tasty! Taking inspiration from the likes of Woodstock and Glastonbury, FEST Camden transforms its rooftop into the Wonderfest Rooftop for a summer of festival-themed fun. With a verdant botanical canopy suspended from a wooden gazebo, an artificial grass lawn, countless colourful umbrellas and an Insta-friendly flower wall, it's a cheerful spot to spend a summer's day in London. Live acoustic performances take place throughout the day before the DJs take over in the evenings, and the Camden Rooftop Cinema Club sees films projected on a large open-air screen. Food comes in the form of a Mediterranean BBQ serving Greek souvlaki and kebabs along with superfood salads, mezze sharing plates, Wonderfest pizzas and vegan Walls ice cream while the playful booze offerings include prosecco popsicles with popping candy, espresso martinis on tap, and frozen bourbon slushies. The darkest, funniest and most debauched kabarett club this side of Berlin! A Weimar-punk jazz band soundtracks a night of dangerously funny kabarett, breathtaking circus and fire-breathing sideshow at its most inappropriate, provocative and hilarious best. Join multi-award-winning Bernie Dieter, Queen of Weimar punk kabarett, as she introduces whisky-soaked, fire-breathing bearded lady Kitty Bang Bang and disgruntled mime Josh Glanc. Vocalist Myra DuBois, gender bending contortionist and aerialist Beau Sargent and hair hanging supremo Fancy Chance complete the line-up at the Little Death Club, coming to London as part of the Underbelly Festival on the South Bank this spring/summer. Mind games and masters of deception, the secret world of magicians is revealed at Smoke and Mirrors, a free exhibition at the Wellcome Collection which focuses on the relationship between magic and psychology. Artefacts from Derren Brown, Tommy Cooper, Paul Daniels, Debbie McGee and Harry Houdini illustrate the world of magic as the exhibition seeks out the truth about deception. Discover how bias and suggestion affect our senses and decisions, explore spirit photography and psychology experiments to understand how magic works on - and in - your mind. On top of a multi-storey car park in Stratford, Roof East is back for spring/summer 2019 with the Rooftop Film Club setting up the sky high cinema from May. Games, street food and three bars serving rum and raspberry cocktails create a rooftop playground for grown-ups. If you like competitive sports choose from VR foosball, Sluggers batting cages , Birdies Crazy Golf or Lane Games - including S liders Curling, De La Bowl and Puck Buddies. For something more chilled, Flow East Yoga leads Vinyasa Flow Yoga classes every week. Street food is by Eat Chay, serving North Indian inspired Kolkati and signature Kati Rolls, as well as The Burger Project run by the King of Pop-Ups, Jimmy Garcia. E ntrance is free, so grab a drink at one of three bars and enjoy t he views over east London - you can see all the way to the Olympic Park with the red, looping curls of the Orbit rising above it. A great spot for a sundowner. The UK's largest German Bier Festival, Springfest, is back this Easter, bringing a taste of Stuttgart to Alexandra Palace. Upon arrival, you'll be invited into the huge bierkeller, where an army of Bavarian waiters and waitresses will be on hand to serve jugs or pints to the table. All you have to do is choose which German or craft beer you fancy - choose from Schwaben Brau Das Schwarze, Dinkelacker Helles, Dinkelacker Hopfenwunder or a selection of specialist craft beers. There will also be live music from The Oompah Band and The Counterfeit Beatle, DJs from London's infamous pop night Club de Fromage and German street food from top London vendors. Visitors are encouraged to arrive in their finest Oktoberfest chic and Bavarian fashion, with prizes for the best dressed on the night. The World Photography Organisation stages a large-scale London exhibition showing the winning and shortlisted images of the 12th edition of the Sony World Photography Awards at Somerset House. More than 800 of the best professional and amateur contemporary photographs from around the world are selected, capturing everything from fashion to travel, portraiture to sport and photojournalism to architecture. The award is worth $30,000 to the winner and the exhibition includes new works by the photographer who receives the Outstanding Contribution to Photography Award which has previously been given to Martin Parr, William Eggleston and Candida Hofer. The rooftop of the John Lewis department store, high up above Oxford Street, has been transformed once again for summer 2019, re-launching with Roof Fest. One of London's largest roof gardens, the space has been transformed into a festival-themed party space with a boho chic decor. For intimate drinking and dining, guests can book the boho, garden or cherry blossom den or the caravan stage while wooden benches and tables and an abundance of green space are available for everyone to enjoy. Food comes courtesy of Bong Bongs (formerly BBQ Dreamz) with a range of fresh Filipino dishes like crispy fragrant pork belly, grilled aubergine satay curry and adobo glazed chicken while cocktails include chilli margaritas, espresso martinis and a negroni fizz. Live music and DJ sets will run throughout summer along with performances from comedians, drag acts, dancers, contortionists and magicians. Spilling out into the foyer, the Family Weekend really opens up Sadler's Wells to a new generation of dance lovers. Not just for kids, the annual two-day dance festival is aimed at audiences aged 4 to 104 and in 2019 the multi award-winning Spanish company Aracaladanza presents Play, a performance relaying a magical world full of puppetry, balloons and fantastical costumes. The shows on the main stage are complemented by fun activities taking place across the entire building including dance workshops for parents and children, a stay and play session with the performers and free arts and crafts activities in the foyer. From cheap budget hotels to luxury 5 star suites see our discounts for hotels, including Holiday Inn London - Kensington from 71% off.